Coaches have visited the main cities Houston, Dallas, Fort Worth areas and many surrounding areas (Duncanville, DeSoto, Plano, Denton, McKinney, Allen, Sound Grand Prairie, Marshall, Aledo, Cedar Hill, and the Lubbock area). So they have been putting in the miles Thursday & Friday. Just 2 days! -As you can see, they are in a pistol formation and a pretty nice breakdown of how the play happens. -It does seem like they run the pistol QB read a lot like Fran so don't expect that to change (watch JMU highlights vs. SMU on youtube and you see it) but they throw the ball more than Fran ever did. -If we run a 3-4 defense, I'm very excited but at the same time concerned on the DL to be able to play it. -NG (ideal size 285+) McClarty; Ulluocha; ??? -Considering we really only have 1 current safety commit, it makes sense I we run a 3-4 as we likely have enough if we are going from 3 safety position team to 2 safety position team. We'll see. -Having 3-4 LB types on the field to support the run is much better from a size and talent level compared to our previous 4-2-5 with a Bandit, and 2 LBs. In regards to coaches, anyone notice the LB coach is the Associate HC while the Defensive Coordinator is the Asst. HC & Safeties coach? I found that to be interesting. Usually the DC or OC is Associate HC and I rarely see much of a Asst. HC but maybe those were the incentives to get those coaches here. I've seen Co-OCs listed as Associate or Assist. HCs but not usually position coaches. Keff tweeted today that QB JMU commit Cole Johnson is visiting this weekend. He's close to OC Brett Elliott. Keff also noted Cole Johnson has family in Austin. What does this mean for current QBs on roster and the 2 commits? It should be interesting to see if he commits what happens. 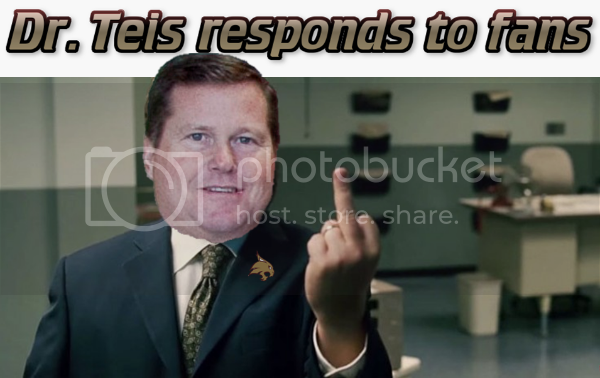 I can't imagine TXST having Jones, White, LG Williams, Peterson, Kent, Devin Williams, and Cole Johnson or even the 2017 season having 6 QBs on roster. A common mistake by fans is to call a formation an offense. The pistol is a formation just like the shot gun. What one coach may do in the pistol is not going to be the same as another coach. What it comes down to is scheme. Example Mike Leach ran his Air Raid scheme out of the shot gun. Urban Meyer ran more of a Single wing power run scheme out of shot gun. Rich Rodriguez ran a triple option scheme out of shot gun. All used the same formations or similar formations but each used it for different reasons. Fran was an old school I formation Option coach and tried to adapt his offensive scheme to both the Shotgun and Pistol. It's a good scheme but he feared the deep, and mid level pass. I expect this offense scheme to be more like what Tom Herman uses. A west coast passing game with a power/ read option twist. "A bobcat will fight you with everything he has: with four claws, teeth, speed and brains." Thanks for the comments Madcat. Its a good point. To be fair he actually said "pistol QB read" so he wasn't saying Frans offense and the new offense would be the same, but rather that play may not be gone. Keff indicated a JC WR would be visiting this month: Chaffey WR Marquis Wimberly plans to visit #TXST this month. 11 offers but he puts TXST towards the top of his list. Also, Keff noted we offered a DE but he doesn't say if he's a 2016 or 2017 recruit: TXST offer: Dean Taylor, 6-5, 228-pound DE from Pearland. Not to high on the Chaffey guy. Don't mind doing without him. Don't like 6'2" receivers who run great routes and catch the ball with their hands, not their pads? If he can run more than 5 yards past the line of scrimmage, he may qualify as our "deep threat" given last year's passing game! Saw the tape. Not all about tape though. I'll take our coaches decisions at this point. Not since Battle/Erickson did we have solid WRs that made plays for a non-QB! I'll go with this coaching staff to find players. I know we want the best but with 2.5 weeks, we aren't getting those... part of the reason why we're seeing just as many 2017 and even 2018 offers going out because they are behind other programs even if Withers recruited them at JMU. it was a personal opinion. Not a professional one. I like the guys we have so far as well as what we are bringing back. Think that we can do a lot with them. So we have some receivers that maybe don't have the best hands, but are quick and have large enough frames to take on more muscle mass. I've read some about WRs being able to transition to LB in addition to the more traditional switch to DB, particularly in a 3-4 primary scheme. I wonder if that might play out with some of our guys since both of those defensive positions are weak. If we are operating in a 3-4, WRs that have converted to LB might help with quickness to contain & penetrate if the DL can do their jobs in occupying space & pulling double-teams. I'm just spitballing though. Of course, our overall team & coaching/playcalling had so many problems last year that I'm not sure you could effectively analyze a single position for weaknesses. Gunter, Bowens & Mercer need to step up this off-season. Really, all of our WRs need to step up their game. While some of the drops were from Jones firing unnecessary bullets, most of them were simply flubbed catches. Several were also sloppy with their routes, although if I knew tcoach wasn't going to greenlight a throw to any receiver at or beyond a 10 yard route, I might be sloppy as well.